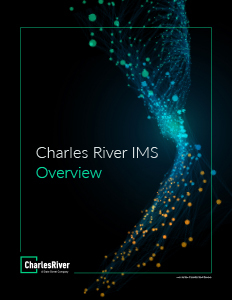 Charles River Development, a State Street Company, provides an end-to-end solution to automate front and middle office investment management functions for buy-side firms in the institutional asset and fund management, private wealth, alternative investments, insurance, banking, and pension markets, representing over $25 trillion of assets under management globally and 25,000 users. Charles River maintains a local presence in all major financial centers worldwide. In North America, Charles River has headquarters in Burlington, Massachusetts and offices in New York, Toronto, and Indianapolis. The firm has over 130 implementation and client services experts across the US and Canada, including teams in Arizona, California, New Jersey, Texas and Wisconsin. As a global solution provider, Charles River serves 350 buy-side firms in over 40 countries worldwide, including 205 US-based clients and more than 34 asset management firms in Canada.